Hello, fellow alligator seekers. Jeff and I are settling into a new area today. We’ve picked out a campsite, staked our claim — it’s a waterfront site, ya’ll! — and are now heading to the closest town for supplies. So before the dust settles and I can’t remember where we’ve been, here’s the dirt on Hopkins Prairie, which was our first ‘home’ on the road. Hopkins Prairie is about an hour or so from Daytona in the Ocala National Forest in central Florida. That part of Florida is kind of cool — it’s scrubby and in an odd way reminds me of the dunes on the Outer Banks. But nowhere close to the ocean. It’s a lovely, oak-infested oasis. 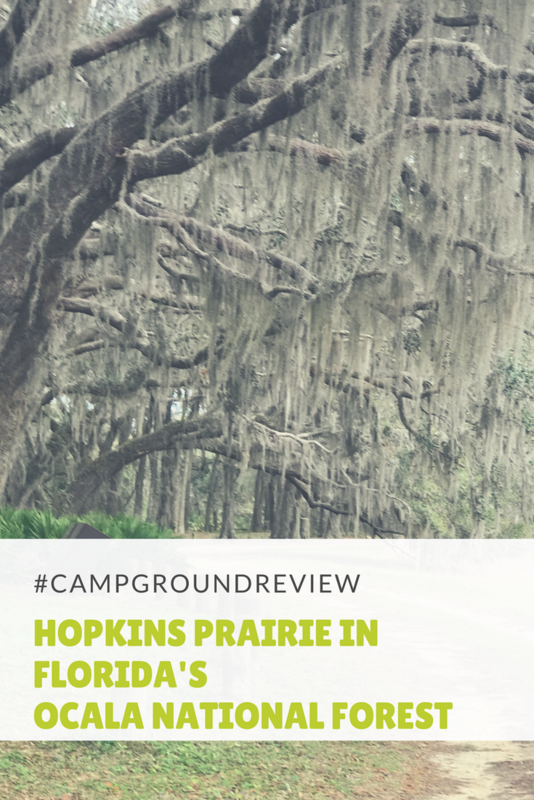 Where most of the terrain around that area is dusty with a bunch of sand, palmettos and twisty short trees, Hopkins Prairie is exactly what it sounds like. A prairie. A water-logged prairie. I read somewhere that Hopkins Prairie is actually a lake — it looks like one on the map. In real life, it looks like a field after a lot of rain, albeit a pretty field. With alligators. 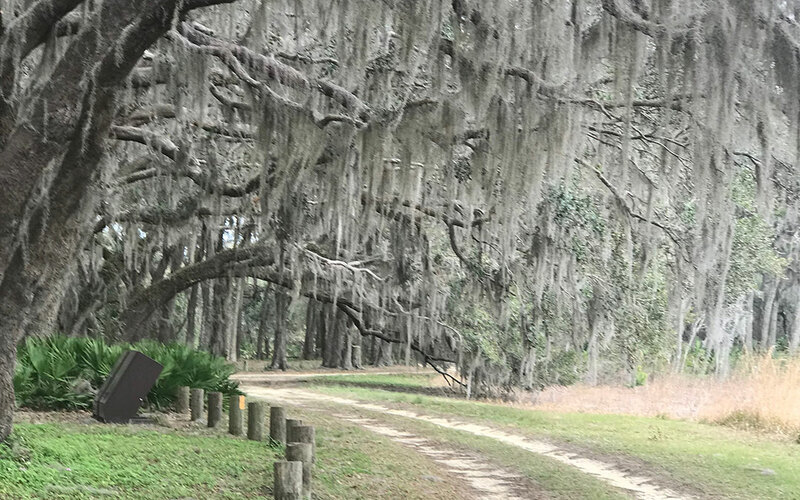 And right in the middle of the water-logged prairie is a campground fairyland oasis of giant twisty live oaks and tons of Spanish moss. Seriously, it looks like alligator-slash-elf habitat. While we did not see any actual elves during our stay there, we did see a fat, happy alligator smiling and sunbathing away on the edge of the lake. He was on the opposite edge from where Jeff was setting up our solar and a bit too far away to get a really good photo. Or get eaten. 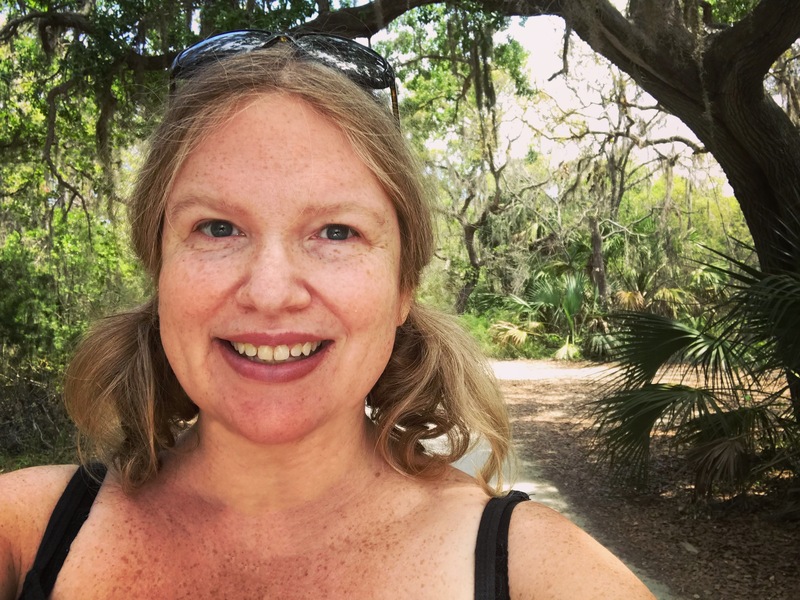 It was a bit unnerving for this Minnesota-grown girl to know that there were alligators hanging out just next to our campsite, happy to snack on inattentive girls and/or basset hounds. Lucky for all, that didn’t happen. Hopkins Prairie is a pretty primitive setup. There’s no electricity anywhere unless you bring it with you. There are about 20 sites and when we stayed (March of 2018) the campsites were $10 a night, with a notice that the rates may go up to $15 soon. There’s one water source on the campground, but the water is not potable. We used it for anything that needed boiling (cleaning, oatmeal, coffee) and bought bottled water at the store for drinking. There were vault toilets (outhouses, if you’re not hip to campground-speak) — one for the women and one for the men. They were not completely unpleasant, except while we were staying there, my friend Elizabeth mentioned on Facebook that when she was little she was scared that there was a man in the outhouse. So naturally, that became a concern of mine as well. The campsites are a bit on top of each other. While we were there, the campground was never 100% full, so we didn’t have anybody up in our business, except for the campground host, who seemed very nice but a little loopy. He patrolled the campground on his motorcycle about 86 times a day. I may or may not have called him Barney Fife. One day he drove into our campsite straight into a post and fell over. Like, motorcycle on top of him fell over. All was well, but, you know. He ran into a post and fell over. Two very cool features of the campground, other than being likely elf-habitat are the bat house and the Florida Trail. The bat house is right on the edge of the prairie with bats that, according to the sign, are giant 11” bats from Brazil. I didn’t see any monster bats while I was there, so was able to enjoy the bat-love without being subjected to the large bats. I feel the same about bats as I do about spiders and dentists. I get that they’re doing good stuff, but I’d rather that they not do it near me. The Florida Trail meanders 1,000 miles through Florida, right through the campground, so we saw a lot of hikers and parking by day use folks. If you stay at Hopkins Prairie, you can catch the trail by the bat house and hike around the campground to the entrance. The trail is very well maintained and very pretty, although I was a little freaked out by Jeff’s snake vigilance. 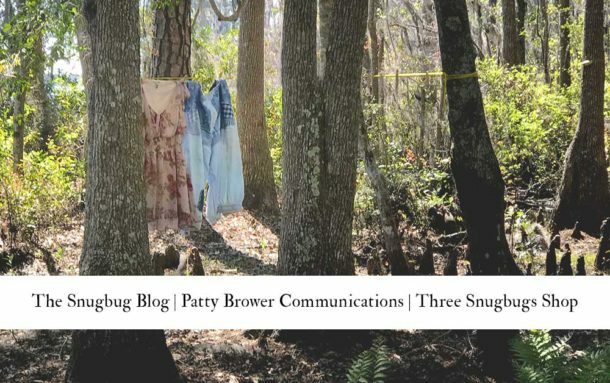 Seriously guys, what with the alligator neighbor, giant bats, possible outhouse-man and anxiety-producing snakes, I was on high alert the whole time I was there. WHICH reminds me. There were also ticks. Like, a lot of ticks. Like, come prepared with repellant that’s 100% Deet. And a flamethrower. Jeff found a few ticks latched on to him and Peppermint every day. I did not find as many — only two chomped on me the whole time I was there, but seriously, Snugbugs. Jeff found new ones AT NIGHT IN BED crawling on him. He must have some seriously delicious tick pheromones. Other creatures at Hopkins Prairie not as horrifying as what I’ve already mentioned, were the sandhill cranes, who Jeff tells me were just passing through and not permanent residents. The first morning we woke up and were relaxing with our coffee when we heard a god-awful racket high up in the trees right next to where we were sitting. If you haven’t heard a sandhill crane before… well… Google it. They are loud creatures. Loud, startling, creatures. After my initial shock, it was fun to listen to them hollering in the morning and evenings. They spent their days wading in the prairie water, seemingly unconcerned that the fat, happy alligator might be jonesing for a crane snack. There’s a spring that you can go swimming in for free if you would like. When you’re headed into the campground, instead of hanging a right into the campground, keep going straight. About 100 feet down the road, there’s a trail to the right. Park on the side of the road. The spring is not far at all about 20 feet in. Watch out for fishing hooks, alligators, ticks, giant bats and men hiding in the outhouse. Where to find food and supplies. The closest town is Salt Springs, which is… a very small, rural town. It’s about 20 minutes away by car. There’s a pricey, not overly stocked grocery shop, that has hummus and other necessities. Fun fact: they have the merlot in the cooler. That is the only wine they have chilled. There is also, of course, the ubiquitous Dollar General. If you require more supplies, Ocala is a larger town (around 60K) that’s about 45 minutes away. Salty’s, a strange bar/convenience store/diner/souvenir shop, would sometimes have super-fast free wifi that I could get in the van in the parking lot. And sometimes it was slower than molasses. If you use Verizon, I had three or four bars LTE at the campground. I had absolutely no service in Salt Springs. Literally. No bars. We didn’t wash clothes while there, so I can’t speak to that at all. And if you need to shower, we made do with camp baths and swimming but there’s a big campground in town (Salt Springs Recreational Area) that on the website lists ‘bathhouse’ under day-use amenities, charging $6 per person for the pleasure. Like many campgrounds, Hopkins Prairie has a lot of tree cover, so if you have solar, you’ll have to get crafty. We had a campsite on the outer ring of the campground, so we drug our solar out to the very sunny prairie and hid the power unit in the bushes — we have a Goal Zero Yeti and 100 watt solar briefcase. The campsites at Hopkins Prairie are all basically the same, so no problems with staying there in your minivan camper. There’s not much in the way of facilities, other than non-potable water from a pump and two vault toilets for the whole campground. Most of the campsites have a barrier that keeps you from pulling all the way into the campsite, so if you like things to be all close and tidy or like parking close to the fire ring to take ridongculous long-exposure night shots, well, not all the sites at Hopkins Prairie will work that well for you. Keep up with our adventures on Instagram or check out past vanlife posts on our blog. Or if you’re a Facebooker (like I am) connect up with me, or follow our page, Three Snugbugs for more van and 3 Snugubugs updates. Note: links on this page may or may not be affiliate links, meaning if you click and buy, we will get a bit of money with which to purchase insect repellant and hound dog treats!